New for 2011, the AL-KO ALU Powerline range offers class leading machines full of innovative AL-KO features with aluminium decks. 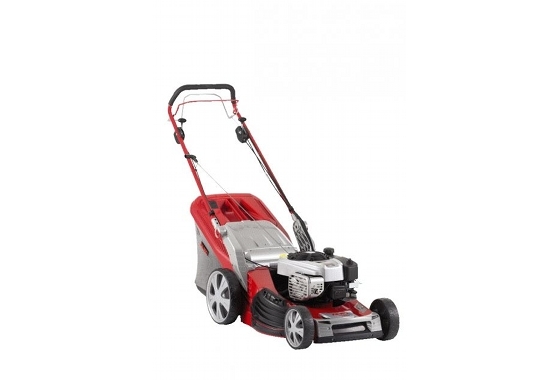 The 5300BRVC BBC ALU Powerline is a 52cm self propelled rotary mower. Powered by an easy starting and powerful new Briggs & Stratton 850 Series engine, this model also benefits from the AL-KO 4INONE function – with collection, mulch, side and rear discharge capabilities all from one value for money machine. The 5300BRVC BBC ALU Powerline also features AL-KO Highwheels for improved traction, and adjustable aluminium handles to improve operator posture and comfort. On AL-KO ALU models, the deck is manufactured in cast aluminium for long life and corrosion resistance, complete with robust aluminium lifting handle and bumper. This model also features variable speed control for ease of use. Cockpit Handle: The “Cockpit” concept features a soft touch sleeve over a steel skeleton, with soft touch OPC and drive handles which togther form a flush, comfortable handle when gripped in operation. Ease of operation is improved further by clear user instructions integrated into the control panel – each lever features icons displaying exactly how each control is operated. 4INONE function: Collect, mulch, side or rear discharge – all with a single machine. This model is supplied with a mulch kit, plus a side discharge chute for longer grass, as standard. Blade Brake Clutch: The Blade Brake Clutch disengages the drive to the blade as the operator releases the safety handle, therefore enabling the operator to leave the engine running, but unattended without the blade rotating.